British Petroleum (BP) signed a memorandum of understanding to increase the flow of oil from the oil fields of Kirkuk, in the country’s north. BP has been asked by the Iraqi oil ministry to boost production capacity from the field to more than 700,000 barrels per day (bpd), after it was reclaimed by Baghdad from Kurdish forces last October. Under the agreement, BP will conduct surveys and studies necessary to develop Kirkuk’s fields and boost their output, according to an oil ministry statement citing Michael Townshend, the head of BP’s Middle East business. The London-based oil giant is returning to a region where it has a long history. Kirkuk’s oil was discovered by the forebears of BP and France’s Total in 1927. 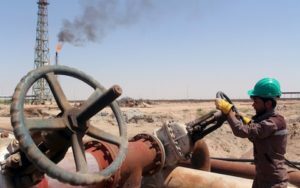 BP provided technical assistance to Iraq’s state-run North Oil Co. until 2015, when work halted due to fighting between government troops and Islamic State militants. Iraq, the second largest producer of oil within OPEC after Saudi Arabia, is balancing the need to raise output to finance its post-ISIL reconstruction efforts while maintaining production cut quotas as part of an agreement with other fellow oil exporting states to stabilize prices. Written by: Jaber Ali on January 21, 2018. Posted by Jaber Ali on Jan 21 2018. Filed under Energy, Headlines, World News. You can follow any responses to this entry through the RSS 2.0. Both comments and pings are currently closed.